When you crave comfort food during a cold winter night, you’re likely to end up having a nice, warm, yet unhealthy meal with thousands of calories and low nutritional value, unless you’re having soup. The good news is that you can combine the feeling of fullness, comfort and nutritional benefit in one big round platter known as gebeta, a mainstay of Ethiopian cuisine that goes back to the nineteenth century. The Ethiopians place a large, pancake-textured crepe-like gluten-free bread called injera on top of the platter, made of teff flour, water and yeast. It comes with various types of water-based stews, or Ethiopian curries. The variety of options that suit all diets reflects the Ethiopian culture of social consolidation, in addition to the evident generosity in the size of the personal platter. You have to use your right hand to eat after washing it, and if someone gives you a bite of food with their hand, accept it welcomingly, because it stands for compassion. This is what I experienced at the Habasha restaurant on a not-so-popular street in Hawally. Customers become friends of the restaurant’s owners on the first visit. The ambience of the restaurant and its charm make you open up to strangers and exchange cordial conversations with them, as if you have known them for ages. The 10-year-old eatery is run by an Ethiopian family. The fragrance of their heritage that emanates from the place separates you from the time and the country you live in – it’s like being in a time capsule hurtling to an authentic atmosphere not affected by the customs of the surrounding African states. 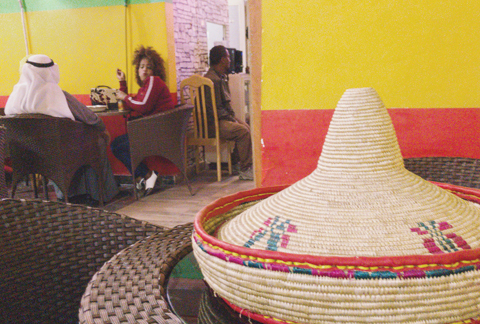 The first thing one notices is the simplicity of the décor – despite the stark colors of the Ethiopian flag that cover the walls and hang in the form of curtains, in addition to pottery pitchers dangling from the ceiling. Every week, a flight from Ethiopia brings the batter mixture for the injera and berbere, an essential spice blend for Ethiopian dishes. The food is mildly spicy, so water is the best beverage to go with it. Do not hesitate to ask for Ethiopian coffee at the end of your meal, which comes in an earthen jug enough for several people. Besides the rich flavor and aroma, it’s served with popcorn that comes in a handmade straw bowl on the side along with incense burning in an evaporator. One waitress told Kuwait Times they love to celebrate their festive holidays by dancing, which is part of their culture. Therefore, they tend to gather with their friends and relatives in their free time to listen to music and dance. “It’s the best way to charge our energy for work and uphold our positive spirit for a new day,” she said. Interestingly, some Kuwaiti customers frequent the restaurant daily, although Ethiopian cuisine is not known to the Kuwaiti people. I asked one of the diners the reason for his great attachment to the restaurant, because I have seen him more than once there. “I love the hospitable Ethiopian people. I have become fluent in the Ethiopian language, even though I have never travelled to their country!” he enthused.